When a 501c charity decides to throw a casino night fundraiser or is thinking about doing so. The first place they call is the casino company. This is not were to start. The place to start is the chief of police of the town you want to hold your fundraiser. They will explain all the laws to you. The idea is to plan your event within the parameters of the law for maximum profit and doing so above board. You will have to obtain a permit from him anyhow, so you might as well get an understanding of the laws through him. Our price quote will make a lot more sense if you know the laws prior to calling. Otherwise, Rent A Casino can work with you to plan and execute the most lavish and memorable casino event. Rent A Casino can also offer your organization the finest Black Tie, VIP, table rentals and accessories available on the market. Now that you’ve read and understand the bazaar laws, there are some companies that will put themselves and their companies at risk of fines, seizure of equipment and maybe even jail. Rent A Casino is very sensitive and compliant to the state laws and we will not put ourselves at risk for the sake of any event. 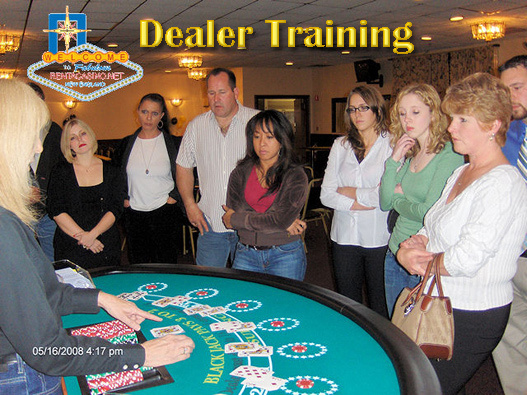 The dealers at your event must be unpaid volunteers from the organization. Rent A Casino does have the capability to provide your volunteer dealers with the necessary training to deal each game at your event. After we receive your rental agreement, you can arrange to have someone from our company come out to your site and train your dealers. We can also provide you some pointers on how to run a profitable table. The purpose of these notes is to serve as a guide to anyone planning a casino party fund-raiser event. There are certain points listed that might not be applicable to your event. However, we have attempted to address the typical scenarios an organizer will likely encounter. Generally when asked the question. “How much money would you like to raise at this event?” Most hosts realize that they haven’t given it enough thought. Having a realistic goal of how much money you would like to raise is the key starting point. It should determine the price of your entrance fee and the limit of your expenses. Decide how much money you would like to make from this event. Draft a statement of your proposed revenue and Expenses. Obviously the key to your bottom line is to maximize your revenue and minimize your expenses. As fundamental as this concept is, most organizations disregard it when running one of these events. Delegate the task of ticket sales to more than one person. It is far easier for 20 people to each sell 10 tickets than it is for 1 person to sell 200 tickets. Hold each of these 20 people responsible for the sale of their allotment of tickets. Bottom Line: This is usually your primary source of revenue and the financial success of your event depends on meeting your goal of tickets sold. Find at least one table sponsor for each casino table being used and the sponsored amount should generally be at least $100 dollars. Encourage your sponsors to provide “gag” gifts that promote their business to be distributed at “their” table. For example – a blackjack table sponsored by a dentist could give away a free toothbrush (with the sponsor’s name imprinted) for each blackjack that is dealt. Or, the dealer could be dressed in the sponsor uniform. Make your sponsors feel as though they are getting value for their donation and not only are they more likely to attend the event, getting a similar sponsorship the next year will be much easier. Bottom Line: Table sponsorship should cover at least the entire rental cost of the casino equipment. This will vary depending on the”upscaleness” of your event. Ticket prices and what people are getting for their money will generally determine whether guest’s drinks are included in the ticket price or if they need to pay for them. Typically, the more expensive the entrance fees the less likely you are to charge additional for drinks. On “drink inclusive” events a limited bar (beer, wine, soda) is suggested to curb costs. On other events entrance fee usually includes two “drink tickets” which are typically redeemed at a rate of one ticket for a soft drink and two tickets for wine or beer. Additional drinks require the purchase of more drink tickets. Bottom Line: Drinks can vary between being a good source of revenue to being a very large expense. Manage your bar wisely. This follows a similar format to your drinks. Bottom Line: Don’t leave people feeling “short changed” because of poor quality or insufficient food. However, don’t spend all your money on providing a spectacular meal because that is not the focus of this type of evening. These are often incorporated into a casino evening and I offer the following advantage/disadvantage thoughts on the inclusion of a silent auction. Requires additional sponsors to donate auction items. Interrupts the flow of the casino evening. Takes people away from the tables. Much more organization and coordinating involved. Bottom Line: Silent auctions are often the backbone of revenues generated at fundraising parties. However, they do require a lot of time and effort to coordinate successfully. Delegate at least one person whose sole responsibility is to manage the silent auction of the event. Live auctions can generate a tremendous amount of revenue for the event, if done correctly. There are several key ingredients to a successful live auction. Maintain a captive audience – shut down all other activity during this time. Shorter is better – your live auction should run no more than 30-40 minutes. Less is more – have only a few; generally less than 10 – high ticket items for auction. Bottom Line: Keep the live auction short and it can be very, very sweet. Bottom Line: Keep the “donation” to an amount that encourages people to get more script rather than setting it too high and not having anyone buy in again. Again, the fundamental rule regarding expenses is to keep them to a minimum without compromising your event. Invariably, free is the key word here. Attempt to secure a facility at no cost to your event. There are generally several organizations that are open to making their facility available at little or no charge. Often balloons and streamers or ribbon will suffice when decoration the event facility. Always weigh up the cost of any props you are considering using. People are typically not at your event for the decorations. Solicit donations if possible however, prioritize a table sponsorship donation ahead of a prop donation almost every time. Provide the casino operator with accurate head counts so the appropriate amount of equipment is supplied. Too much equipment on hand results in a bigger expense and having too few tables to accommodate your guests is one of the surest ways to spoil your event. Arrange to staff the game tables with your own volunteers. There will be a charge for training them, but this cost is more than offset by the saving of not paying for these dealers. It is illegal in the state of Massachusetts to hire professional dealers for charity events. This means that you cannot hire them from the casino rental company. Any rental company that offers to sell them to you is a corrupt operator. Arrange with your beverage supplier to be able to return all unopened bottles. This way you only have to pay for the beverages you have sold. Some facilities might require a one-night insurance coverage policy for your event, especially if you are not being charged for the venue. The same applies to security and parking. This will vary with different locations and organizations. Be aware of this possible cost when selection a location. Designate a team of volunteers to take care of the facility cleaning. We wish to raise $3500 from our event. Our intention is to sell 200 tickets. Our total expenses are $1500. What then needs to be determined is if this price is appropriate for what you intend to provide your guests and will your market support the sale of your proposed quantity of tickets at this price. Remember that you might even be under charging your guests! By selling the proposed number of tickets and following the guidelines above you will always realize at-least your intended net profit and in most cases a higher amount. However, if you don’t sell your intended number of tickets or if your expenses are higher than budgeted; your net profit is adversely effected in both cases. Set up early at the facility. Have additional script and drink tickets at cash desk. Have sponsors signs in place on all tables. Have bow ties, uniforms etc. available for volunteer dealers. Have dealers assigned to a specific table ahead of time. Post signs prominently indication chip denominations. Post information about buying more script. Clearly indicate location of cash desk. Have change or drink tickets available at bar or bars. Designate all tasks ahead of time – specifically breakdown and clean up. Keep thorough notes for your next event – the second time is always easier.